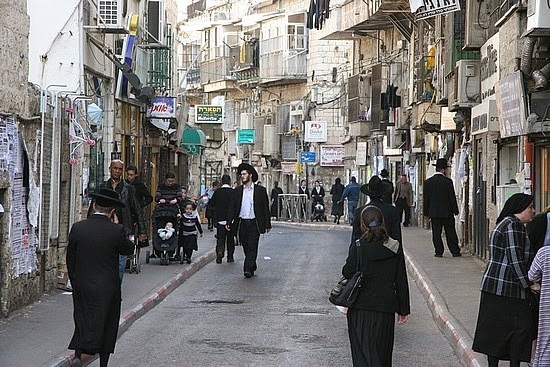 *Mea Shearim is an ultra Orthodox neighbourhood of Jerusalem populated mainly by Haredi Jews. It has been described as like walking into a 19th century Eastern European 'shtetl'. I have long been interested and intrigued. However it is NOT a tourist site or a place for 'gwarking' and I sought some good advice on dress and behaviour before my visit. **Eid Al Adha is a major Muslim festival of sacrifice which commemorates the prophet Ibrahim's sacrifice of his son, Ishmael, to Allah as an act obedience. "Eid Mubarak" - have a blessed Eid. and put up with my impatient, nagging e-mails! We all had a particularly good nights' sleep and were ready for the last and most symbolic day. The trail ascends wild desert hills to the hilltop suburbs of Bethlehem through Beit Sahour to Manger Square and the Basilica of the Nativity where our journey ends and the Christian faith began. The views E over the Dead Sea to Jordan's Mountains of Moab and Mount Nebo were superb, birds of prey drifted on the thermals and a few camels wandered the hills. It just seemed timeless and in keeping with our last day together, until the separation barrier and the Israeli settlements which imprison Bethlehem come into view and reminded us of the realities of the 21st century. And so journey's end - The Basilica of the Nativity. St Helena in 326 AD, is one of the oldest complete churches in Christendom and almost indisputably marks the site of Jesus’ birth. In 135 AD Emperor Hadrian ordered a Temple to Adonis to be built over the Cave of the Nativity in order to 'wipe it out'. When the Roman Empire became Christian and Helena Augusta, mother of the emperor, ordered that a church be built over the spot, the cave was found to have been preserved underneath the pagan temple. Through later historical periods, the sanctity of the place was respected, in part because for Muslims Jesus is an important Prophet. The Church was inscribed on UNESCO's World Heritage list in 2012 and is currently undergoing a major restoration. When I was here as a volunteer in 2011 I would stop to visit and explore the Church most evenings as I walked 'home', long after the tourists had fled back to Jerusalem - clutching their bargain olive wood mementos bought at the shop owned by their guide's cousin, relieved that they had not been kidnapped by Islamic terrorists and grateful that the queue to visit the grotto was less than 2 hours. The silence, the candle light reflecting off the gold and silver and dancing on the icons, the mystery and aura was palpable. Sadly today the Basilica felt nothing more than a noisy crowded tourist attraction. Nevertheless we each had our own thoughts and reason for being here, the last 10 days had been very, very special and a few beers together at my favourite bar in Manger Square provided a very appropriate 'Ice Cold In Alex' ending. This region in particular, but to some degree all such desert areas, play an important part in the social and religious life of the people of the Near East. Traditionally, the desert wilderness is seen as a place of encounter with God, where the forces of evil can be confronted and, with His assistance, overcome. The prophets of old lived in and emerged from the desert, and saints of every age have often gone to spend time there. The desert is a symbol of a spiritual wilderness: there is a paradox between the profound stillness and emptiness of the desert and the sense of life and energy that it evokes. The Bible is full of imagery of waters flowing in the wilderness and the desert coming to life. It was into the desert that Jesus went to be alone with God, to reflect on his mission, to be prepared for his ministry and to be tempted by the devil. It was going to be another very hot day in the rusty brown hills of the Bethlehem wilderness. It was already touching 30C. when we set off at 8am. The sensible option was to do the first couple of miles along a rather boring desert road in the service-taxi. Today's Health and Safety briefing - 'make sure you have plenty of water as usual and DON'T touch any metallic objects you see by the path' - the whole area is an Israeli military training ground but this walk has been well planned, today is Shabbat* - we set off. We gained height on a good track, behind us the Dead Sea and to the E. the abrupt cliffs of Moab. We were heading into the Qidron valley which leads to the old city of Jerusalem. The sense of desolation and solitude is profound, what brought Holy Men here must have been a morbid imagination. We pass the ruins of Hasmonean, a 2nd century BC fortress later used by Herod as a notorious dungeon where he executed his son and heir - something he seemed to specialise in! 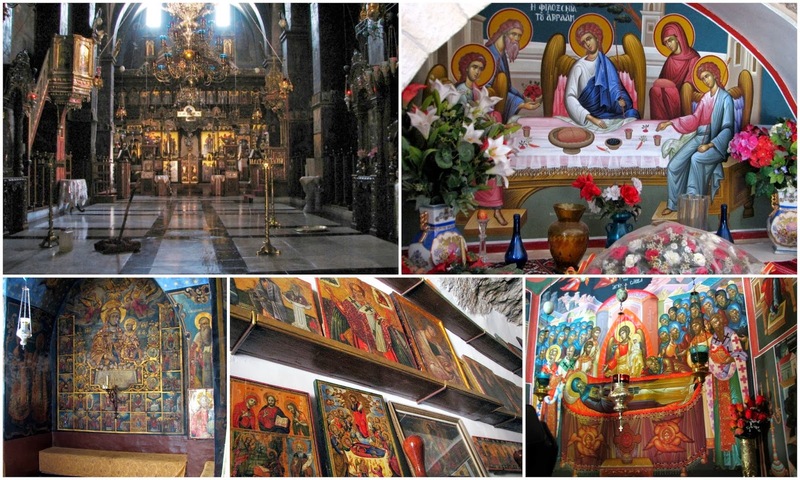 It was renovated in the 5th century by St Saba. The trek ends 3 miles further on at Mar Saba where the monastery clings to the cliffs of Wadi Qidron, vying with St George's as the most dramatic viewpoint in Palestine. The cool stream in the canyon looks inviting but is full of raw sewerage from an Israeli settlement near Jerusalem. Only men (and male animals!) are permitted to enter the monastery. 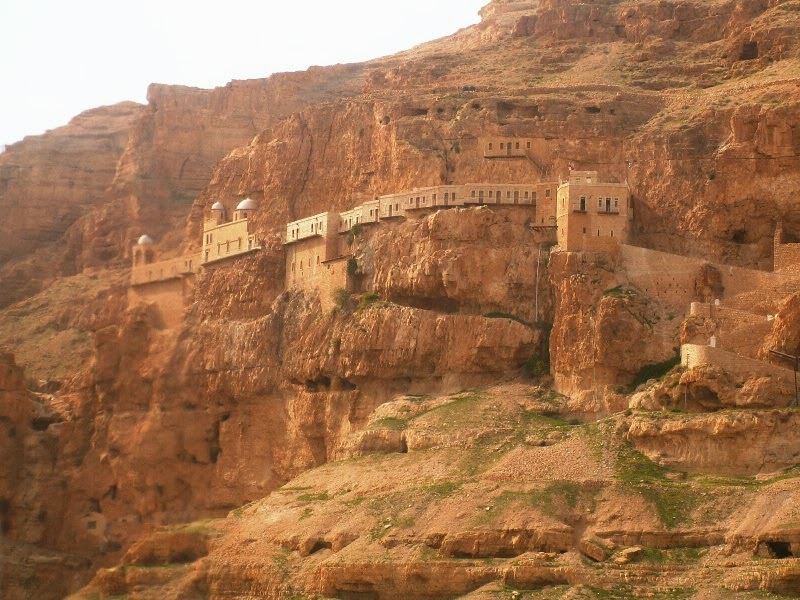 Mar Saba was founded by St Saba in 482 AD, prior to which he lived in a cave in the gorge. Despite its sacking by the Persians in the 7th century, the monastery was destined to become one of the largest in the Holy Land. Its population once approached 5000. In 1834 it was severely damaged in an earthquake, but later renovated to its present splendour. Today only a few monks remain, living an ascetic life. The skulls of 120 monks martyred in the Persian massacre of 614 are kept in the cave church. The body of St Saba, stolen by Venetians but restituted by Pope Paul VI in 1965, lies behind glass at the entrance to the new church. Across the Qidron gorge numerous hermitage caves can be seen – including that used by St Saba. An enterprising young Palestinian has built a concrete gazebo 5 miles into the wilderness from Bethlehem at Tel al Qamar (Hill of the Moon) providing a 'luxury' desert camping experience! Sitting around the camp fire reminiscing about our adventures was a fitting way to spend our last evening. Tomorrow we would be in Bethlehem. *Shabbat - the Jewish day of rest. Today is described as the highlight of the trail, a good path through a rocky canyon, barren desert and arguably the most spectacular sight on the trail - the Monastery of St George of Choziba. However the temperature was forecast to reach 37C. by midday and with no shade for the last three or four hours of walking we were prepared to abandon today's walk at he Monastery and call the service-taxi to take us on to the Muslim desert shrine of Nabi Musa. The path out of Jericho leads us through the ruins of Tulul Abu al-'Alayiq (Herod's Winter Palace) circa 10 BC and soon we are entering a gash in the mountains - Wadi al-Quelt. Spectacular Wadi Quelt descends from east of Jerusalem down to Jericho with the ancient Roman road following its southern rim. It is believed that this gorge inspired the words of the Psalm. In the 3rd and 4th centuries this area became a centre for desert monasticism and the caves of hermits, who met at the monastery for weekly mass and a communal meal, still dot the cliffs. Soon the spectacular monastery comes into view. 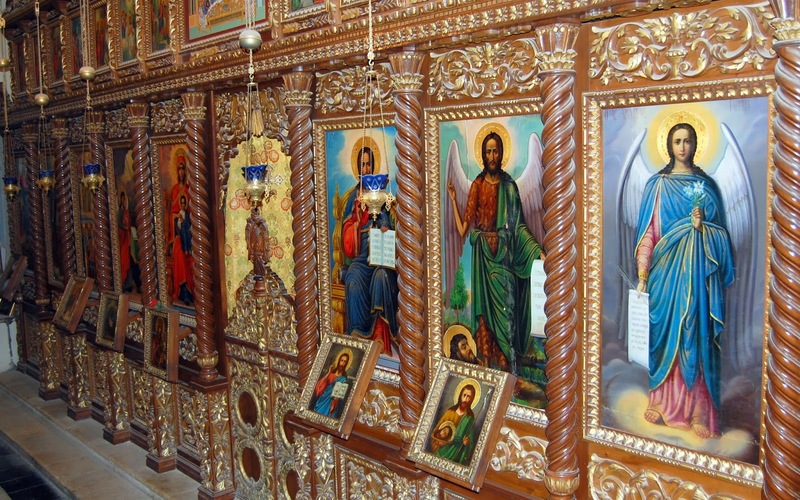 The Monastery of St George of Choziba was founded in circa 480 AD by Saint John of Thebes over the cave where Elija encountered God. It was sacked by the Persians in 614, renovated by the Crusaders, abandoned and in 1878 restored by a Greek monk called Kalanikos. It was now seriously hot. We climbed a good path from the monastery to the road, at minus 100'. The way ahead along a shepherd's track in this heat looked ominous, we were disappointed but our guide was conscious of his responsibilities and although we had perfected our TE Lawrence impersonations even a spot of bare back camel trekking was probably not an option. And so it was that we arrived at Nabi Musa.. The Muslim shrine and pilgrimage site of the Maqam Al Nabi Mus (Tomb of the Prophet Moses) is directly opposite Mount Nebo in Jordan from where according to Old Testament tradition, just prior to his death, Moses looked across at the 'Promised Land’. There is an Arabic inscription over the tomb: ‘The construction of this maqam over the grave of the Prophet who spoke with God, Moses, is ordered by His Majesty Sultan Thaher Abu Al-Fateh Baybars in the year 688 Hijra'. The nearby mausoleum is said to be that of A’isha, Mohammed’s favourite wife, whilst half a mile SW along the road is the maqam of Hassan al-Rai, the shepherd of Moses. For 700 years, the shrine was the focus of a huge annual Muslim pilgrimage. Accompanied by drums and flutes, thousands walked through the desert hills from Jerusalem’s al-Aqsa Mosque for five days of prayers and festivities. 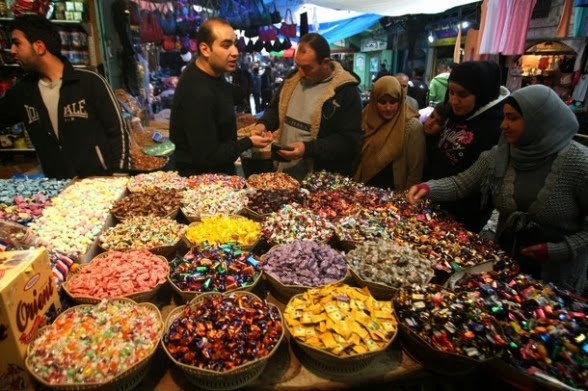 Beginning as a celebration of Islam's triumph over the Crusaders it coincided with the Holy Week of the Eastern church. Banned first during the British Mandate it was revived in 1997 until the al-Aqsa Intifada in September 2000, since when Israel has declared the area a 'military security zone'. Today there are few visitors. We were woken by the sun rising over Jordan, which came piercing into the open side of our tent, announced by a chorus of barking dogs. A shorter walk today through desert terrain along an old road to the oasis town of Jericho, 850' below sea-level, and with many Old Testament references possibly the world's oldest continually inhabited town. Here we would say 'goodbye' to Nidal S and meet our new guide Nidal R (who turned out to be my next door neighbour when I had stayed in Beit Sahour in 2011). After a few hours the 12th century (Greek Orthodox) Monastery of the Qurantul (the Forty) comes into view, clinging like a swallow's nest to the cliff face summit of Jebel Qurantal (Mount of the Forty), 980' (but rising 1830' above Jericho). Whilst the distant view is jaw-dropping, closer the unsightly brightly coloured cable-cars seem incongruous with the surroundings. Directly west, at the distance of a mile and a half, is the high and precipitous mountain called Quarantania, from a tradition that our Saviour here fasted forty days and forty nights, and also that this is the 'high mountain' from whose top the tempter exhibited ‘all the kingdoms of the world, and the glory of them’. The side facing the plain is as perpendicular, and apparently as high as the rock of Gibraltar, and upon the very summit are still visible the ruins of an ancient convent. Midway below are caverns hewn in the perpendicular where hermits formerly retired to fast and pray in imitation of the 'forty days' and it is said that even at the present time there is to be found an occasional Copt or Abyssinian languishing out his quarantania in this doleful place. We found it, however, inhabited only by 'Bedawin', several of whom made their appearance, well armed, many hundred feet above us. The thought of a few armed Bedawin was tempting and after a much needed shower at our hotel ( ! ) we set off, first for a tour of the Umayyad period (8th century) Hisham's Palace. After lunch we did our own thing. Iain went for a float on the Dead Sea, Lars and I visited the SIRA (Swedish International Relief Association) Special Education School with which he is involved and Johannes went into town for a beer. And Zacchaeus stood, and said unto the Lord: Behold, Lord, the half of my goods I give to the poor; and if I have taken any thing from any man by false accusation, I restore him fourfold. 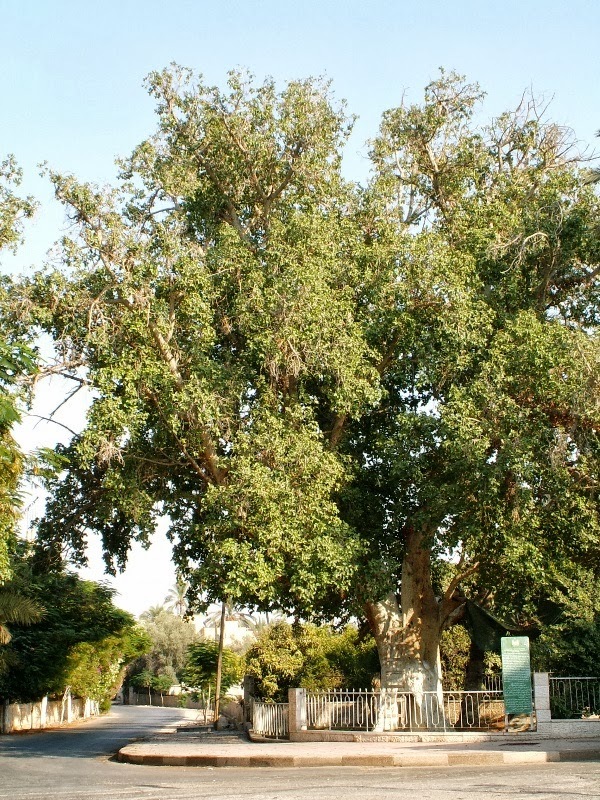 Follow the 'tourist' signs (or buses) to 'ain es-Sultan street and in the garden of what is now the 'Russian Cultural Centre and Holy Land Museum' is Zacchaeus's tree - a fine 2000 year old sycamore fig. You don't have to walk far to find its rival. 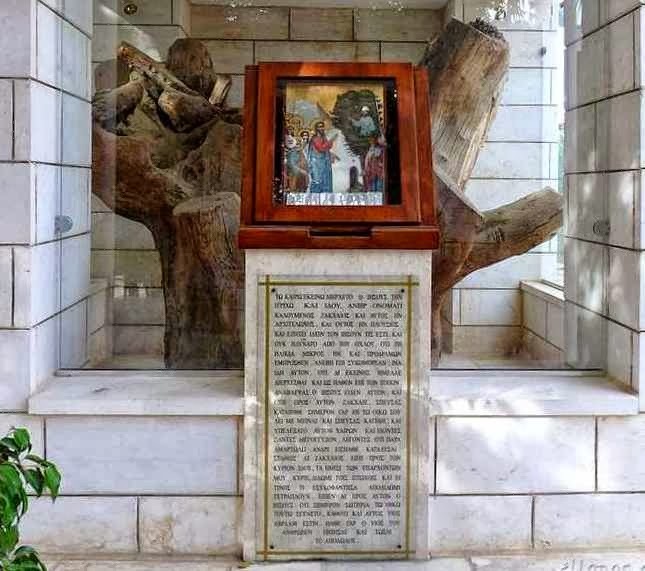 Outside the Greek Orthodox Church, protected in a glass case, behold the trunk of Zacchaeus's tree - not well preserved after 2000 years. Confused? Ask one of the Franciscan brothers at the Church of the Good Shepherd a few yards up the road and he will point you to a fine tree on a grassy area behind the church.